If you don’t already have a license for the latest version of 1Password for Mac, the best way to upgrade is to sign up for a 1Password account. You’ll be able to download the latest app for free, move your existing data to your new 1Password account, and enjoy the latest version of 1Password free for 30 days. Removing the 1Password 3 app will not affect your 1Password data. Your data is stored separately. However, do not use an “app cleaner” or “uninstaller” tool to remove additional files. Some of these tools are a bit overzealous and will remove more than just the app – they will remove your data (including backups) as well. Choose File > Backup Data File from the menu bar in 1Password 3. Quit 1Password 3 by choosing 1Password > Quit from the menu bar. Locate the 1Password 3 app in your Applications folder. The icon will look like this, and you can press the Space bar while it is selected to use Quick Look to confirm its version number. Drag the 1Password 3 app to the Trash. Again, do not use an “app cleaner” or “uninstaller” tool to remove additional files. Some of these tools are a bit overzealous and will remove more than just the app – they will remove your data (including backups) as well. 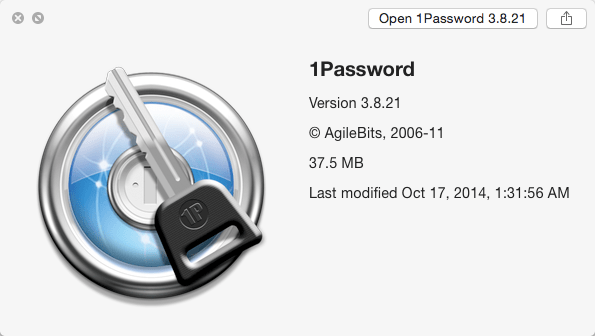 Download and install the latest version of 1Password for Mac from our website. Open your newly installed copy of 1Password. On the Welcome screen, sign up for a 1Password account, or create a standalone vault to use 1Password for Mac with a license. Choose File > Import, then click 1Password Keychain. Select a vault to import your data to, then click Choose File and select your 1Password 3 vault. All of your Logins, Secure Notes, and other data should now be available after you unlock 1Password and answer the configuration questions. If you have any trouble, send us a diagnostics report. If you’re using Safari, the 1Password extension is included with the 1Password app and doesn’t need to be installed separately. If you’re using a different browser, like Chrome or Firefox, install the 1Password extension.